Thank you for your interest in A Teacher’s Guide to Reading Conferences. 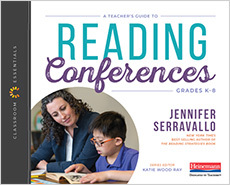 We hope you find Jen Serravallo’s six types of conferences and classroom video helpful as you discover the power conferring has to help students make progress. In our sample chapter, you’ll read Chapter One which shows how to get your classroom ready for conferences as well as a Mentor Spotlight where Jen interviews Lucy Calkins about conferring.